BBC NEWS | Business | End of the road for 'real Chinatown'? End of the road for 'real Chinatown'? The Edgware Road in London, one of the capital's major arteries, is famous for its rich ethnic mix - but one expat community hub has grown to prominence there almost unnoticed by the wider world. Outside the complex at number 399, in industrial Colindale, there is no external trace of its presence, bar the faded signage on a sprawling concrete wall that announces simply Oriental City. Yet every week, some 8,000 to 10,000 people flow through the doors to visit the shops, restaurants, supermarket and community centre of what has been billed London's second Chinatown, after its better known namesake in Soho's Gerrard Street. "In fact, it is London's real Chinatown - not a tourist attraction like in the West End," says Yip Fai Liu, who owns Oriental City restaurant China City. "It's where Chinese people come from all over the UK to eat crispy belly pork that tastes like it's from Hong Kong and where new immigrants can get access to vital resources, like legal services, English lessons and Coronation Street dubbed into Chinese," he adds. "There is nowhere quite like it anywhere else in the country." But at the end of this month, all that will change dramatically. On 1 June, the 40 or so mostly small, family-owned East and South East Asian businesses in Oriental City will trade at their existing premises for the last time. In the following week or so, bulldozers will make way for the construction of a £450m development, including a 28-storey tower of luxury apartments, a school and the sort of retailers that make many British High Streets a homogenous affair. "The project includes designated space for all the traders - more space than in the existing centre," insists Peter Virdee, managing director at property investment and development firm B&S Property, which is managing the site on behalf of Oriental City's owner Nereus Ltd. 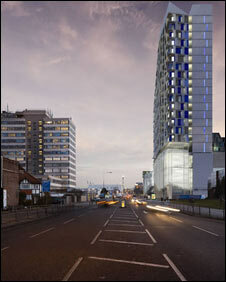 Even so, the tenants would have to be away from the site for at least three years. As a result, they will either set up elsewhere for good or, more likely, be unable to afford to move and go out of business, says Yip Fai Liu. He formed the Oriental City Tenants' Association (Octa) in November 2006 to fight the plans, which they feel were railroaded through without proper consultation. "Brent Council know very well we are here and the contribution to English life we make, but the Chinese are generally reserved, take their lot and don't make a fuss," he says. "We think, well, if we speak up, will it make a difference? That's why there are no Chinese MPs in parliament and the community has about the same low voting record as the general population," he adds. Born in Bradford and living in Croydon, Yip Fai Liu describes himself as a "typical Chinese cockney". Unlike his compatriots, he has had no qualms of sounding off about decisions he sees as being motivated by money rather than the preservation of multiculturalism. Octa's campaign galvanised support from many non-Asian fans of Oriental City, most famously footballer Ian Wright, who led a delegation to meet planning officials at City Hall. The traders took their fight all the way to the government, but neither London's mayor at the time, Ken Livingstone, nor the Department for Communities and Local Government would get involved. "We are not beggars," says Yip Fai Liu. "We just want about a quarter of the current space for some shops, the community centre and the food court, relatively near where we are now, so as to keep the momentum going until we can move back into the new premises." "It is very important that the North London Chinese Association finds a new space to keep offering its services for Chinese families in Barnet, Brent and Harrow - the biggest community in Britain," says the group's chairman David Ho, a solicitor from Birmingham. "It's a vital link between Asian and British life." B&S Property says it is currently looking at possible sites where at least some of Oriental City's tenants may be able to move. But so far, nothing suitable has been found and time is running out for the 800 or so workers employed by the centre's businesses. Terumi Tomita, who set up Japanese crockery and tableware shop Utsuwa-No-Yakata in Oriental City in 1993, started heavily discounting her products at the beginning of May in anticipation of closing. 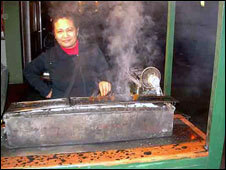 She and her husband are busy negotiating a contract elsewhere, but having opened the shop there in 1993 under the former Japanese owners Yohan Plaza, she is sad to leave the premises, where she has enjoyed a thriving trade. "People come here to eat, to do their grocery shopping, to meet their friends and all the businesses bounce off each other," she says. "We will miss that," she adds. Upstairs, China City is a mammoth restaurant, seating 400 at one sitting. 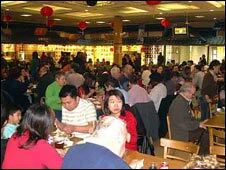 Its Cantonese banquets are popular for occasions including weddings and celebrations such as Chinese New Year, and it is almost always fully booked on weekends. Yip Fai Liu is concerned for his 60-strong staff, most of whom he will not be able to retain to work in his other restaurants in Leicester Square and Russell Square. "About 1,000 families will be directly economically affected by the redevelopment and that is before weighing up the social implications," he says. Many of the businesses have already suffered from a drop in custom as successive owners over the past two years have failed to invest in and maintain the centre. Some members of the community allege that there was a deliberate attempt to run it down to promote the case for its demolition. In addition, talk of its demise has led to confusion over whether it had already closed down. "We have been piggy in the middle while investors have bought and sold Oriental City to make a quick buck," fumes Yip Fai Liu, who believes the redevelopment will take much longer than the three years promised. "We are all very itchy about the future and worried that after 10 years of building up this community, we will have to watch it disappear overnight."